Families are made in Heaven. That was never so apparent as it was for Lynn Ellen Doxon and Robert Habiger in the creation of their family through the adoption of Anastasia, Janalyn and Lydia. Lynn and Robert's journey takes them halfway around the world to Ukraine, and lasts for two and a half years. In that time they learn lessons of perseverance, faith, love, hope and surrender to God's will. The laws and economy of Ukraine are unstable, the officials fearful and suspicious and the circumstances wearisome. At times is seems like the whole world is attempting to block the adoption. Lynn describes how a couple grew in ways they never expected when they set out to adopt just one unwanted child, how three beautiful girls found their family, and how one region of Ukraine was opened up to foreign adoption despite fearsome opposition. The story also covers the lives of the three girls, Anastasia, Snijana and Irena from their point of view. They begged in the streets to get enough to eat and were cared for by their older brother and sister when their mother was drunk or absent, which was nearly all the time. Then one day a dog attacked Snijana. The authorities came to in-vestigate and the girls were taken to the regional orphanage for children under four. Life in the orphanage was not easy but Anastasia and Snijana were soon favorites of the staff. Then came the visit from a strange woman and the girls were told she would be their new Mama. They would be getting a Mama! Best of all, they would have a Papa too! Their new Mama and Papa were very nice; but as time went by, their Mama and Papa didn't take them away from the orphanage. Snijana didn't believe they would ever leave, while Anastasia and her youngest sister Irena, never gave up in their belief that their Mama and Papa would come and get them. Lynn shares the humor, the joy, the fear and the anger she experiences in the process of adopting her daughters. She opens herself up, showing that while she and Robert did not do everything right, continued trust in each other, prayer and belief in their love for the girls would see Lynn's dream of a family come true. Print out this order form and mail it to us to order your copy. Download the eBook for your Kindle Reader from Amazon.com. 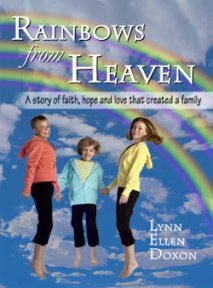 Rainbows From Heaven is a heart melt respecting and honoring the divine power of family love. It chronicles the trials and tribulations of a couple adopting children half way around the world in the Ukraine. The author spotlights the stench of the foster care system in our own country focusing on the questionable policy of reunification, which may put a child back into harms way. The trip to the Ukraine comes after being foster parents and losing three "therapeutic need" children. These out of their control circumstances lead the author to decide to take her church up on an offer to go to the Ukraine. Once there, three little girls become the objects of her affection and the fight for adoption begins. This true-life story details the shattered sadness of a child snatching food from a dog so she could eat only to get mauled. The reader learns about children being forced to use the bathroom on demand as if they were pups being housebroken. A maze of factors twines through situations of poverty, abuse, and heart wrenching emotional isolation. Yet, this book proves to be an inspirational story of boundless faith. Tender passages like "She held my face between her hands and rubbed my nose with her nose, then hugged me and snuggled into my lap while I cried" peels back the layers of depression and frustration. Ms. Doxon bears witness to the pain and anguish of her fight while she shares her jubilant ravishing love for three incredible beautiful children proving that even the near impossible can be achieved. (This book details the) efforts made by (Lynn Ellen Doxon) and her husband to adopt a child. First, they try the foster-child route without success; then, after several other disappointments, they look into adopting from Ukraine, where their church had ties. Intent on adopting a little girl whose photo they had committed to memory, they find their hopes dashed early on when they discover that she has been reclaimed by her family. Next, they fall in love with two girls from the local orphanage, and, when a third sister is added to the mix, decide to adopt her as well. The remainder of the book provides blow-by-blow descriptions of what complicated the adoption finalization. Bureaucratic nightmares predominate with more judicial and paper error than can be readily fathomed. By the time the new family arrives home in New Mexico, the odyssey verges on the miraculous.